So, there's this problem out there. I run into it a lot. Jayme-the-wonder-publicist runs into it all the time. It hit Blue Moon like a ton of bricks. It hits yarn stores looking for business loans. You guys have encountered it. It's a knitters problem. It is a lack of understanding (or respect) for the sheer numbers of knitters out there. -It happened in St. Louis, where the library (despite a warning from the knitting guild and the publisher) decided how many knitters there could possibly be and ran short of books and chairs. -It happened in MA. where all the knitters couldn't even fit in the shop and spilled into the street and there wasn't even room to sit down. -it happened in Doylestown where when I arrived the shop had TEN chairs and were extremely reluctant to get more out. I kept saying "You need more chairs" and they kept saying "It'll be Ok." with this look on their face like they just didn't know how to break it to me that I wrote KNITTING books, and nobody was coming. - It happened to me at a dinner party where Joe called me "a bestselling author" and someone said "well...Not really." and Joe said "How not really? Here are the numbers" and the person said "Yeah, but it's knitting books." -it happened with one of my webhosts, who, despite being told how much traffic I get, made his own judgement about what sort of traffic would be possible when I said it was "a knitting blog" . - it happens to Jayme-the-wonder-publicist on the phone with little tiny bookstores who want to hold knitting events and can't understand why she won't book me into their store that holds 27 people. They get right ticked when she tells them that although they are a lovely, lovely store, they haven't got enough room. They KNOW how many knitters there are, and they KNOW Jayme is wrong. - it happened to Full Thread Ahead when they asked the city for a permit because they knew how many knitters there were going to be and the city had the hardest time believing them. It happens over and over and over again, and it's starting to bug me. It's not that I think that knitting is such an important thing that everyone should worship it. I don't especially care if the muggles don't know about us. They have their lifestyle, I have mine. It's ok with me if we need to tell them what they need to know when they need to know it. I personally am unacquainted with the numbers and needs people who fly fish. It isn't that they are uninformed. It is that they cannot let go of their own ideas enough to cope. It is that when we explain to them how many chairs/ bandwidth/ credit card transactions/ books/ yarn/ microphones/ beers we are going to need and they pat us on our pretty little heads and go get the number of chairs/ bandwidth/ credit card transactions/ books/ yarn/ microphones/ beers that they think we will need and leave us all standing around without all that stuff that I start getting snotty. There are plenty of excuses for people not being prepared. No problem. We didn't warn you? Mea culpa. All is forgiven. How should you know. 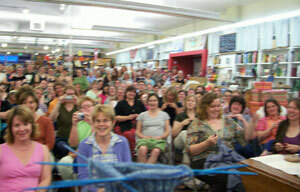 There are no excuses for when we say "There are 300 knitters coming to your bookstore on Friday. " and they say "Sure...sure honey. Hundreds of knitters. Uh-huh. Why don't you go knit on your cute little sock over there while we PREPARE TO SCREW YOU OVER BECAUSE WE ARE SUFFERING FROM A TERMINAL STEREOTYPE." In any case, Jayme-the-wonder-publicist and I have come up with an idea. The new book comes out soon and since it's a book about knitting as a destination and the community of knitters that populate it, we thought that this would be an excellent time to make a point. We would like to show the media and the muggles exactly how many knitters there are, how seriously we take it, and exactly how large a demographic they are ticking of when they discount our numbers and our buying power by ignoring the things that we tell them. Essentially, I don't care if they think we are stupid. I don't care if they think Sock Clubs are stupid, and I will still sleep at night if they laugh at us. I just want them not to openly mock us and impede our attempts at commerce or community. To that end, we would like to invite you to a Really Big Book Launch. The shock the muggles night event will be March 22nd in New York City at FIT, The Fashion Institute of Technology. (They have a Knitting Laboratory.) It'll be in the Haft Auditorium, which is in the C building on 27th street just off of 7th avenue. It's really easy to get there. It will be 6pm or later. I'll talk of course, but that's not the point of the evening. The point of the evening is to get a whole whack of knitters into one room, then invite the media to come and see. Straighten them out on the world of possibilities, provide all of us with a moment that we can point to and say "See? Do you see what I mean?" An evening of proof. (Apparently The Knitting Olympics and Knitters Without Borders did not provide the world with this proof.) Now. The auditorium holds 750 people. This means that I could really, really be humiliated here (that's the only part I don't like. The image of me and the media in this huge auditorium while I try to explain that there really, really are a lot of knitters, I swear it.) but I don't think that that's going to be the case. There will be surprises, there will be fun stuff, there will be New York City FILTHY WITH KNITTERS that day. People will see us in coffee shops, on benches, at lunch joints, all converging on FIT. The muggles will look at each other and say "is it just me, or does there seem to be a crazy number of knitters around here today?" From that day forward, every time somebody tries to tell a knitter that she doesn't represent a huge cash spending demographic that needs some damn chairs, she can point to this day. She can show them pictures, and instead of a pat on the head she can get a freakin' handshake and a business loan. Obviously, this plan needs you. We're planning on working some charitable action into it, we're thinking about combining with other people (like the Craft Yarn Council) , but I would love to hear your ideas for how to make this the most fun a whack of knitters have ever had. Maybe a NYC yarn shop crawl? 700+ travelling socks posed in Central Park? Get crazy with it. Represent, knitters. Represent. In other exciting news...the tour page has been updated. I can't tell you how stunned I was to see Alaska and Victoria.